Conquer Macao’s highest summit, at 338 metres, and stand atop a man-made tower by climbing 100 metres up the mast’s vertical ladder. Or freefall from the World’s Highest Bungy Jump at speeds of up to 200km/h for the ultimate rush! 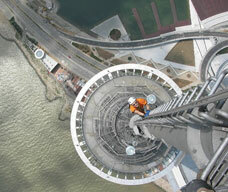 Plunging from a platform 233m high, challengers will experience freefall for an adrenalin-pumping 4-5 seconds . . .
SkyJump utilizes the technology of ‘Fan Descenders’ to enable daredevils to fly through the air at 75km/h, without rebounding or inverting, before decelerating to a comfortable landing speed upon reaching the ground. Skywalk X is a thrilling walk around the main outer rim of the tower, 233 metres above ground. Safety is guaranteed by a world-first overhead rail system . . . but there’s no hand rail!